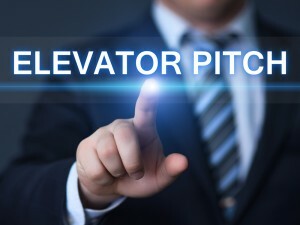 Can you make a great elevator pitch in 7 seconds? When you share your business’ story, at first a buyer may give you only a few seconds of attention. As in the story of Goldilocks and the Three Bears, your content serving sizes need to be just right for any occasion. That’s why marketers put so much focus on perfecting an elevator pitch. The elevator pitch is your most concise message, which captures buyers’ attention in 7 seconds, 23 words or less. An elevator pitch is the right place to start creating your message. But unless you’re ready to expand that message gracefully and intelligently, you’ll never get off the ground floor. With a 1-PageTM Message Map, you can extend your message to 2 minutes, 5 minutes, 20 minutes and more – building on what you said in the first 7 seconds. Start with short content that captures customers’ attention, then earn the right to share longer-form content. I developed this graphic to help you think about how short or long your business message should be. It all depends on your audience, medium and context. But sometimes, 23 words may be too many. You may decide to use even fewer. The most-shared Tweets are only 71 to 100 characters, not the full 140-character limit. The ideal Facebook post is even shorter: 40 characters or less. The best Google+ headlines are 60 characters or less. Here’s an infographic on ideal word counts for posts in social media. It demonstrates why you need a 7-second message as your elevator pitch. A study of New York Times stories by Ann Wiley found that the most common length of a quote in a Times news story is only 7 words. Not only that: the Times uses really short words, averaging 5 characters or less! Do the math: 7 words times 5 characters, plus spaces, means you can expect your quote in the Times to be just 41 characters long! Since there’s so little time and space in which to deliver your initial message, your message needs to break through quickly. If, in the first 7 seconds, your buyer hears a compelling, crystal-clear story, he or she may listen longer. Make sure your first sound bite tastes great: convey exactly what’s in it for customers (WIIFM?). Serve the right-sized content. Don’t serve a full meal when customers want a snack. And don’t expect customers who expect a full meal to be satisfied with hors d’oeuvres. By satisfying customers with the first taste of your message, you quickly earn your way to longer and longer attention spans. Open up your message to 2 minutes, or about 400 words. In 2 minutes of your audience’s time, you can share a fuller message such as a web page, news release, blog, short video, infographic or long social media post. If your buyer finds enough benefit — benefit greater then the effort required — then he or she may go beyond 2 minutes. In 5 minutes or 1,000 words, you can provide a full business message, such as a longer web page, news release, blog or video. Offer a magazine article that’s 1,000 words long or a SlideShare presentation that takes 5 minutes. When you can hold buyers’ attention for 5 minutes, you’re ready for the main event. For carefully considered purchases, whether business to business (B2B) or business to consumer (B2C), buyers are happy to spend 20 minutes or more consuming a piece of content. As they look for new ways to solve a problem or address a need, they’re willing to go that distance to learn even more from your content. Now it’s time to open up your message fully. In 20 minutes of your buyer’s time, you can deliver a speech. Your engineers can write technical white papers that take 20 minutes to read. Or you can show a product demo. You may be able to lure new subscribers with an e-book that’s a 20-minute read. Or provide a detailed technical report that makes your buyers much more savvy – and much more likely to buy from you. At Tellabs, we found that buyers of telecom network equipment loved long-form content. The more expensive the equipment they considered, the more time they were willing to invest in becoming smarter buyers. In a carefully considered purchase of network equipment, it takes buying teams from 3 to 24 months to reach a decision. Such serious buyers actually prefer the 20-minute, 4,000-word content feast over shorter snacks. Year after year, more buyers read white papers for 20 minutes or longer than our 2-minute blogs or 5-minute magazine articles. But when you need 20 minutes of attention, first you have to earn your buyer’s trust. That’s the job of shorter content – 7 seconds, 2 minutes or 5 minutes – that gets buyers interested in bigger and bigger servings. That’s why you need to prepare content in all serving sizes, built around one consistent message. Make sure your content fits your audiences’ appetite and information needs at each step in the buyer’s journey. It’s easy to make your message the right size for every occasion with a 1-Page Message Map. Since a Message Map breaks down your content into bite-size chunks, you can use as many message elements as you need to win your customers’ attention. 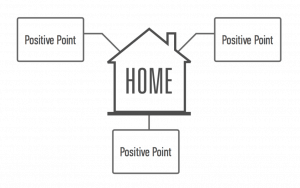 For your 7-second message, use your home base and 3 positive points. 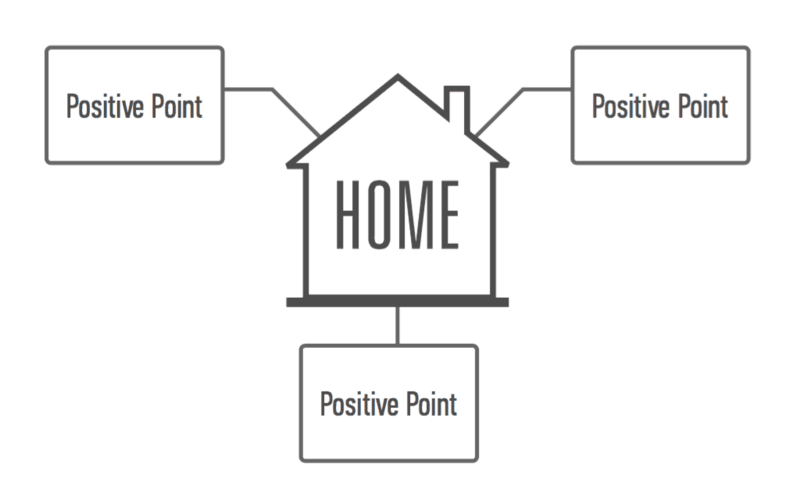 For longer messages, choose a branch from the home base with a positive point, proof points, and examples. Examples include facts and figures, rankings, quotes, testimonials and other information that makes it easy for customers to compare and differentiate your offering. When you sell to large teams of buyers, do buyer persona research first, to figure out exactly which information and media format each type of buyer prefers. Then color-code your Message Map to fit your specific buyer personas. Color-coding ensures that the information you deliver is relevant to each buyer, and that it remains absolutely consistent with the story you’re telling others on the buying team. Make sure your content wins attention in your buyer’s available attention span. Start with one 7-second sound bite, then keep your story growing. A concise message that starts at 7 seconds and scales up to 20 minutes or more covers all the needs your buyers encounter during the buyer’s journey. Co-create your Message Map before you create content. Creating a Message Map gives marketers the power to produce content in real time without a cumbersome review process. When your business message is agreed in advance, there’s no reason to debate it during the review process. So you hit fewer speed bumps and complete reviews much faster. That’s one of many benefits you gain when you create a 1-Page Message Map. Will you attend the ANA/BMA 2016 conference? It’s the biggest U.S. event for B2B marketers. If so, I look forward to seeing you in Chicago in June. You’ll hear from leading marketers such as Robert Rose, Michael Brenner and Steve Liguori. Plus case histories from GE, Aon and many more B2B marketers.